DSC’s proprietary and patented Air-Chassis® product line offers multiple, yet simple and unique ways to economically and efficiently modify almost any major OEM’s chassis platform into a state-of-the-art air suspended transit bus, commercial truck, ambulance, etc., that provides improved vehicle stability, handling, and ride. Provides on-demand (from the vehicle’s normal ride height) options to lower vehicle load floor for easier loading and unloading of passengers and products, and a softer more comfortable vehicle ride. Special Feature: When loading/unloading, Air-Chassis automatically self-levels… regardless of road surface irregularities. Whether you are looking for a better, safer, and easier way to transport people – including complete ADA compliancy – or, you are searching for a vehicle that can transport products faster, with a better and easier way to load and unload cargo – you should learn how DSC’s Air-Chassis can provide what you are wanting and needing in your next vehicle purchase. DSC works directly with major body-builders who up-fit Air-Chassis into completed transit shuttle buses, commercial trucks, and ambulances – DSC will interface closely with your selected up-fitter every step-of-the-way to complete your total vehicle build. For 28 years* Ford has been the number-one supplier of commercial trucks in the U.S. That’s not surprising. With a powerful and dependable lineup of engines and transmissions, including a gas engine and a 6-speed transmission, America counts on Ford trucks to get the job done from sunup to sundown. Ford E-450 Cutaway Chassis are recognized as the leader and number #1 choice for transit shuttle bus operations. The Chevrolet Express 4500 Cutaway is as flexible as they come. It offers owners three available wheelbases, single or dual rear wheels, and three engine choices, allowing it to adapt to any job on the road. If your job has bigger requirements, the Express 4500 Cutaway delivers a max payload of 9,156 lbs. and offers a 159-inch wheelbase. Distinctive Ram ProMaster advantages give you three wheelbases, modular construction, front-wheel-drive engineering, and easy walk-through from cab to cargo area, with surprisingly low cost of ownership for all models. Deleting the cockpit/cargo compartment partition enables faster, less expensive upfits for customers in need of open interior environments (e.g., shuttles, school buses, RVs) without weakening the structural integrity of the cab. Cab forward configuration features a tall and wide windshield for exceptional “down the road” driver and occupant visibility. Payload: 4,945 – 5,189 lb. Maximum towing capacity: 5,100 lb. The UC Series from IC Bus is one-of-a-kind in a lot of ways. To begin with, it’s the first-ever small shuttle that’s fully integrated, which means you’re covered from bumper-to-bumper. The UC Series brings unmatched serviceability, and it’s in a class all by itself when it comes to durability, with a lifecycle almost twice as long as similar small shuttles in the category. Freightliner Trucks is committed to innovative technologies that help customers run efficient businesses both on the road and at the job site. As fuel efficiency becomes a greater part of keeping costs down, Freightliner engineers have responded with natural gas and hybrid vehicles. The largest commercial vehicle full-scale wind tunnel at Freightliner headquarters in Portland, Oregon, allows them to design aerodynamic vehicles that deliver the power customers (and their loads) demand, while reducing fuel consumption. Throughout Freightliner’s innovative processes, they maintain the reliability and durability customers have counted on for years. For nearly 30 years DSC has developed and implemented a successful process for taking Low-Floor™ chassis ideas and quickly, smoothly, and cost effectively turn them into working Air-Chassis® prototypes. DSC has been able to do this by working with the “best” in the auto industry. These companies include, in part: the major vehicle OEMs; specialized vehicle component manufacturers; fabrication, foundry, and machining companies; vehicle design & engineering; vehicle assemblies; vehicle testing, validation, and certifications, etc. DSC is truly a one-stop provider for transforming any Low-Floor chassis concept idea into a prototype Air-Chassis demonstrator and on into a production reality. The EqualizerRamp self-levels, providing a straight surface from the ground/curb all the way into the vehicle. The EqualizerRamp® by Dallas Smith Corp. provides a consistent slope (6:1 slope ration or greater) all the way into the vehicle. 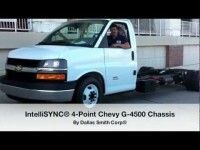 Take a look at the Chevy G-4500 Air-Chassis® with IntelliSYNC®. 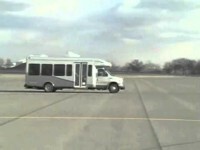 Have a look at the Ford E-450 Air-Chassis® with IntelliSYNC®. 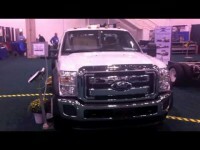 Witness the Ford F-550 Air-Chassis® with IntelliSYNC®. The Friendly Bus® conquers Pikes Peek. Low-Floor™ Shuttle Bus. 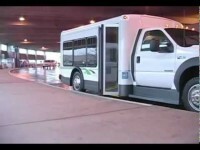 Check out The Friendly Bus® in action! This side by side comparison video shows that loading/unloading is almost three times faster with an Axleless® Low-Floor™ suspension.